Having recently joined the NSP team as Marketing Manager, it’s safe to say that Caren Forbes knows a thing or two about the SUP industry. 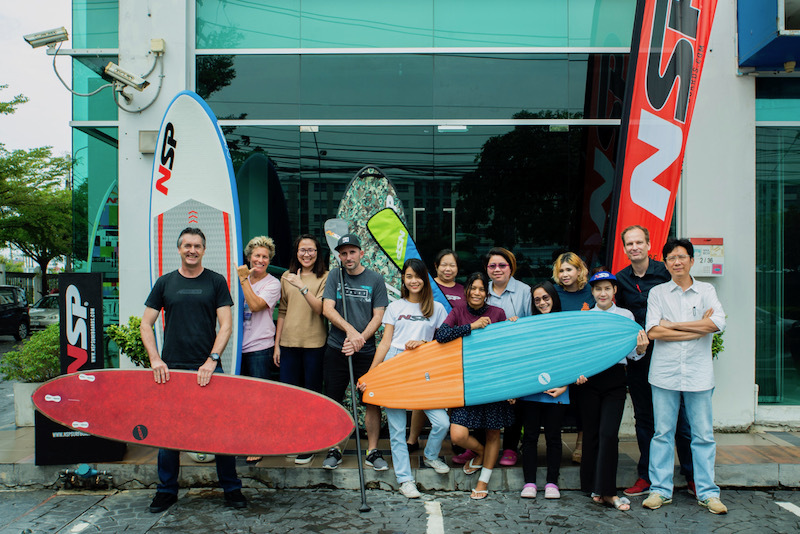 Having previously worked at Starboard SUP as Marketing Manager and then leaving in late 2016 to set up her own SUP retreat in South Thailand, means that she brings a wealth of knowledge to her role at NSP. SOURCE recently caught up with Caren to discuss NSP’s status in Europe and their future plans for distribution, retail and rental. What have been the highlights of the last 12 months for NSP? We have seen stronger growth and interest in NSP’s surf lineup with all new shapes and much of the range updated by a leading Australian surfer (Marcie). We have also seen the increased relevance of our environmental conscious platform mostly driven by Cocomat and the use of coconut husks from Harmless Harvests’ plantations. Our partnership with Sustainable Surf has also been important and now over 90% of our boards feature the Sustainable Surf Ecoboard logo. Despite a significantly smaller team and budget, NSP riders ranked 2nd and 3rd on the SUPRacer rankings; Travis Grant set a new record and won his 3rd Molokai 2 Oahu (the world’s most respected open ocean race). Where have you seen the biggest retail success in Europe in recent years? The UK is experiencing a very strong uplift in NSP surf sales in a category where NSP almost disappeared in the past three years. Portugal is one of NSP’s leading markets in surf – as a Mecca for surfing in Europe – and it has become key in modernising NSP’s surf image. Our distributor there, Pedro Soares Martins of PSM Distribution, has been instrumental in NSP’s success. His riders are quick to show NSP’s strength with very capable shapes that are able to handle the large and heavy Atlantic swells that surfers from around Europe travel to Portugal to experience. Similar to Portugal, Spain has embraced NSP surf as well, and we have built a strong team of SUP riders that we expect to do very well in the upcoming regional and national championships. NSP is well positioned in the surf schools and rental fleets of Europe, from the Canary Islands to Portugal, Spain, France, Germany and Denmark. As riders progress, they are discovering their first board is a lot more versatile to grow with them; especially when compared to beginner only boards that customers generally grow out of very quickly. Which market offers the greatest opportunities in coming years? Portugal and Spain due to the high number of tourists, but also France and UK where customers are rediscovering the NSP brand. 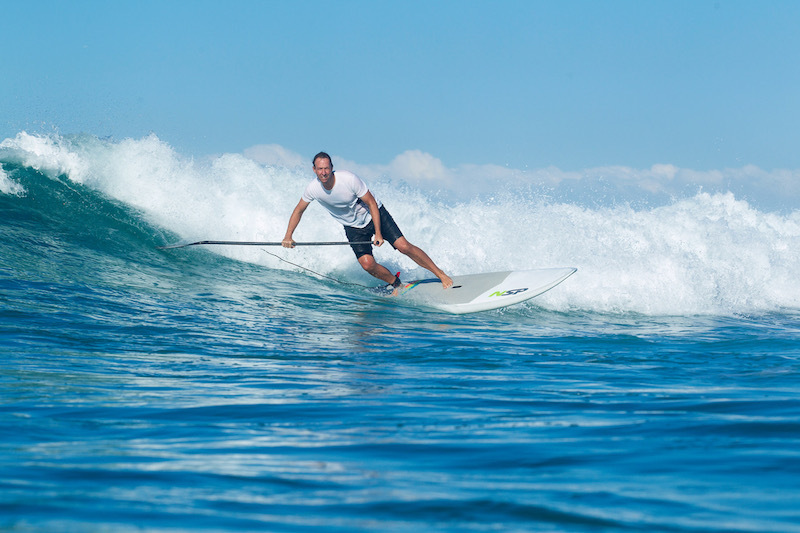 What initiatives have you been implementing with both SUP and surf retailers to drive growth? Supporting key influencers at the beaches and in stores has always been at the heart of NSP’s strategy to grow our presence amongst local surf (and SUP) communities. This has driven a lot of informal demos and trials as people rediscover our boards – the durability of our boards has always been key, but more recently the graphics and shape have all been integral in driving our latest successes. What payment terms do you offer different types of retailer to help them in tougher months? To avoid becoming a bank with various terms and conditions, we focus most of our attention on building great quality boards to ensure better value for money, this has meant we run a lot leaner in a market where cash is king. We prefer to focus our attention on building NSP and not becoming a bank. What is your Amazon policy? Our distributors are free to promote their boards via the avenues that best meet their market needs. Although there are no clear borders with online sales, we do ensure our distributors focus only on sales within their market in order to receive the best support, and ensure a fair playing field for all our distributors and markets. Talk us through your European distribution channels and how you’ve curated these to optimise sales. NSP works with over 20 independent distributors that each look after their own markets. The larger markets regularly assist the smaller markets with shared product for example, and each distributor has their own network of shops, schools and rentals, that they supply into. As most successful distributors handle multiple products, having NSP helps them to win new accounts for other brands in their portfolio. Naturally, this also works the other way around, for example, one of our distributors sells a successful brand of wetsuits which has helped to successfully pitch NSP into an existing, trusted relationship. Which type of surfboard is performing best for you currently at retail in Europe? The NSP fun boards have always been key performers for NSP in each market, but in recent years we are seeing Fish boards continuing to trend, as have our wider soft boards for schools. The introduction of our new Protech range of boards (with the look and feel of a custom epoxy board) is expanding NSP into the hands of a new generation of riders who still want the durability and attractive pricing but without the look of a mass-produced board. Which price point are you seeing the most action in with SUPs? NSP is most famous for building the fastest race boards in the market, thanks to the likes of legends Travis Grant and Toitouan Puyo, as well as the trending NSP DC Surf X surf SUPS, shaped by Dale Chapman. Every day SUPs drive the volume and it’s an ongoing battle to provide the best features and shapes at the best prices. Our 2018 range is designed to ensure we continue to have boards below the magical 1000 Euro market (and these are still well-equipped boards full of features). Talk to us about rental and how you change your operation for this segment of your business. Rentals are key to getting people to experience the NSP shapes and open their minds to owning and exploring NSP’s wider portfolio. The E+ technology, as used in E+ range of Surf and SUP boards, is the technology of choice for most rentals due to what we call, a ballistic sheet that we use on the deck and bottom, delivering outstanding strength, worry-free rentals, and less stress of boards breaking in the middle of the peak season. The ever-popular tourist beaches of Waikiki are a great example of this where you will see many of the NSP boards from past seasons in regular use day in day out, delivering exponential returns of investment for their owners. 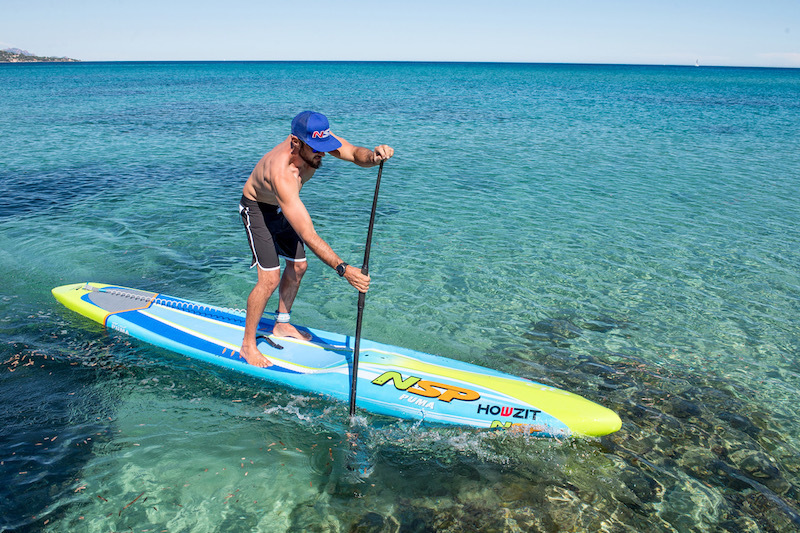 Our 2017 and 2018 range of E+ SUPs also include a lockable feature on the nose of the boards allowing owners to chain and lock their boards when not in use.